Greek yogurt is nothing more than strained regular yogurt. Strain off the whey and you get significantly less yogurt, hence the price jump for the already strained product. All of that said, there are significant differences within the yogurt community. The quality of the milk, the fat content, the culture, and how long the yogurt was allowed to ferment can all affect the taste. Greek yogurt is extremely popular right now; there are a lot of brands out there and they are by no means equal. Some–we’ll leave names out of it–are merely very thick, but satisfying flavor is nowhere to be found. Experiment to find the brand(s) you like. What I like best about Greek yogurt is it is one of the easiest desserts in the world. As long as you start with great tasting yogurt, all you have to do is add a little honey and some toasted nuts or dried fruit and you’re there. Because I never take the straight path to anything, whether I buy Greek or regular yogurt, I strain it to make it thicker. 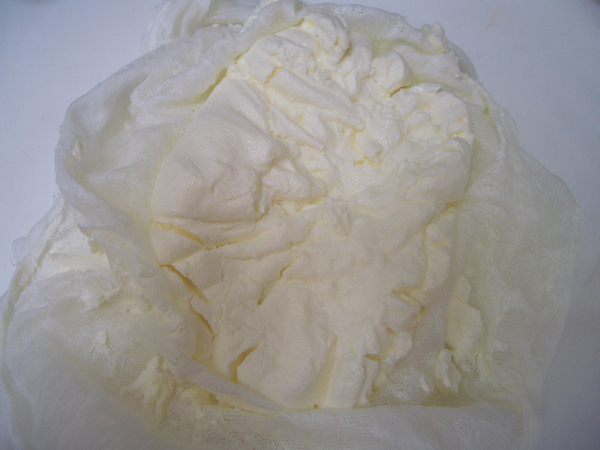 I prefer it to be the consistency of cream cheese, really dense and rich. My personal favorite starter yogurt is Strauss Organic European Style whole milk yogurt. If you do strain your yogurt and find yourself staring at the bottom of the bowl at all the whey and thinking, “what a waste” before you throw it out, have a poke around online to see what some have to say about its effects when used as a health tonic. It keeps for a long time when refrigerated in a sterile container. The first time I had Greek yogurt was in a restaurant where it was molded into a perfect little square, covered in warm thyme honey, and smothered in toasted nuts. 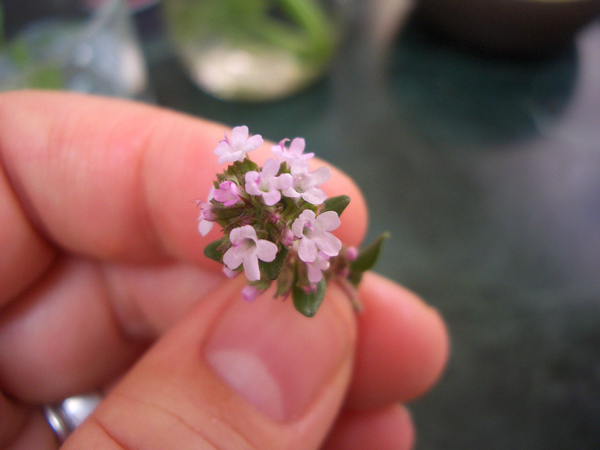 I don’t usually have thyme honey in the cupboard, but I do have a lot of herbs going to flower, and the tiny blooms add a little herbal kick that compliments the other flavors. They are also quite beautiful. At this time of year herb flowers are everywhere. If you have farmers markets in your area, look for vendors with herbs. It’s fairly common for some of the bunches to have blooms. 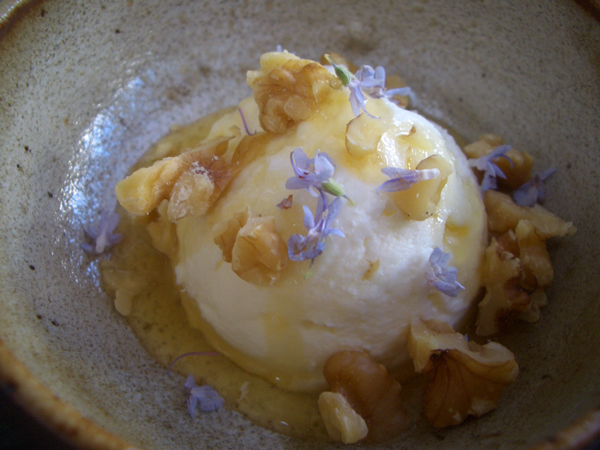 The flowers in the yogurt photos are rosemary flowers. Thyme flowers would also work well. 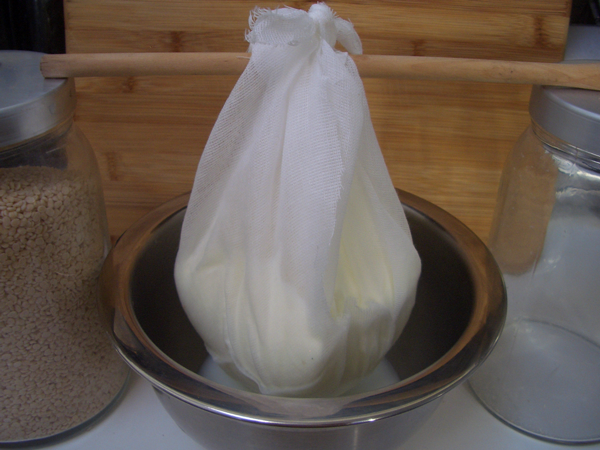 *For those who want to make their own yogurt, see following recipe. 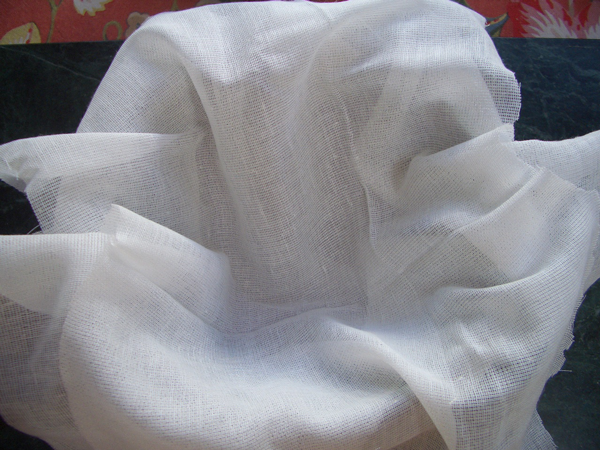 Line a bowl with cheese cloth–if you have the dense fine mesh kind (butter muslin) you only need one layer, but if it’s the loose kind with the wider more irregular holes, you’ll need two layers or the yogurt will flow right through. When cutting the cloth, leave enough room to tie the ends together over the yogurt. Tie the opposite corners together, run a wooden spoon through the opening, and prop it up over a bowl. I strain my yogurt overnight because I know the consistency I like takes at least 8 hours. Strain it when you can check it every couple of hours, and stop when you like what you see. Refrigerate until ready to use. Divide the yogurt between four bowls–I use an ice cream scoop. Warm the honey in the microwave or a small pan. Drizzle over the scoops of yogurt. 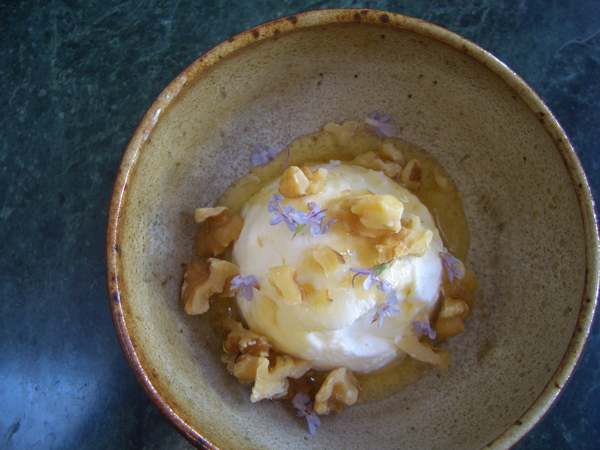 Top with a sprinkle of the nuts and dash of the flowers. Serve while the honey is still warm. You can substitute lowfat or nonfat milk if you prefer. 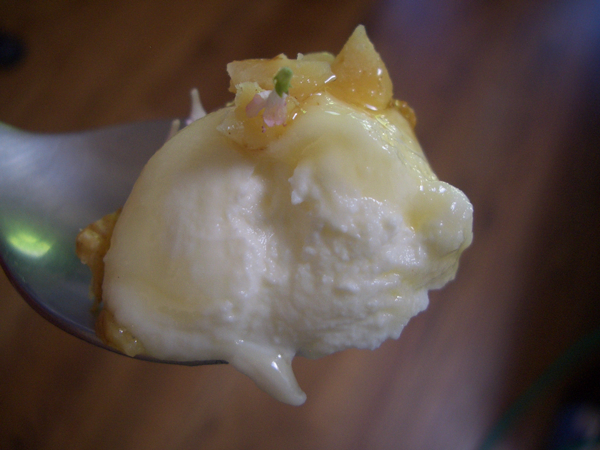 That said, this is the yogurt I make for special occasions, when the extra fat is OK. I don’t eat this every day. You don’t need it, but the process will be much easier if you have a digital thermometer. Some people have been making yogurt for so long they can tell the temperature by the look and touch of it. If the milk is too hot when you add the cultured yogurt, you will kill the culture, similar to adding yeast to water that is too hot. You can use the powdered yogurt starters you get at the store, but this is just as good and easier to find. If you do want to play with cultures I highly recommend these guys. Heat the milk 165F/75C degrees. Take off the heat and cool to 115F/45C degrees. Add the yogurt and gently stir to combine. Gently pour the mixture into the jar or bowl. You don’t want to agitate the mixture, otherwise you’ll get a lot of unwanted froth at the top of the yogurt. If using a jar, add the lid. If using a bowl, cover with plastic wrap or a clean towel with something to secure it around the edges–like a rubber band or kitchen twine–and keep it from falling into the yogurt. At this point you can leave it at room temperature, but it should be a warm room. I use a small insulated picnic cooler–nothing fancy–and place another jar filled with hot water next to the jar of yogurt. I also wrap the jar with the yogurt in a dish towel. My mother puts it in the oven with the light on, but the oven off. Leave the yogurt undisturbed for 6 hours. When you gently jiggle it, the yogurt will have the consistency of loose custard. At this point it will be very mild tasting. If you want tangier yogurt, you’ll need to let it sit for another couple of hours. Refrigerate the yogurt for at least 12 hours before straining to make Greek yogurt.